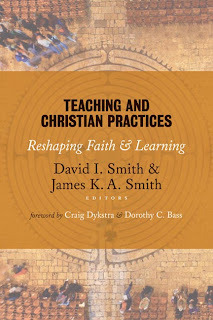 When David Smith and I convened the working group that would eventually lead to the publication of Teaching and Christian Practices: Reshaping Faith & Learning, our goal was to start a conversation, not issue an edict. We always had the sense that we were tentatively exploring new ground, raising new questions, experimenting with some hypotheses. So we didn't see the book as the definitive statement; to the contrary, we published the book just hoping to find some folks who were willing to ask the questions with us. What is "Christian" about these practices? What does Teaching and Christian Practices teach us about pedagogy? What might have to be sacrificed in order to create space for such practices? All good questions. Even within our working group, we couldn't come to consensus on some of these matters, so we tried to create a "big tent" that provided room for different answers and approaches. But what's great is that these questions represent a new conversation in Christian higher education--a new trajectory that is really beginning to think about pedagogy, formation, and the mission of the Christian university. Interestingly, when they helpfully ask what makes "Christian practices" Christian, I'm reminded of conversations we had in our working group in which my own inclination to a liturgical "center" and criterion for Christian practices was met with some reservation--which is why the book's definition is wider (this is where I demur from Volf, for instance). I think the reviewers are right to press this question. In concert with them, I might suggest that Christian practices will be those practices that intentionally "carry" the Christian story--so they are teleologically defined. Much more would needs to be said, but on this point I'm hopeful that some of what I'll say in Imagining the Kingdom: How Worship Works might actually address this question by thinking through the "narrative logic" of Christian practices (with a little help from Bourdieu). Imagining the Kingdom will also clarify how I understand the constructive relationship between practice and reflection (though I still think there is a primacy to practice--I'll marshall Merleau-Ponty to make further refine and defend this claim). But mostly I just want to express my appreciation to the reviewers for a substantive, charitable, critical, constructive review that truly advances the conversation we had hoped to begin. I hope others who join the conversation will also read "Habits of the Heart & Mind."